Cut acorn squash in half crosswise; scrape out seeds and string pulp with metal spoon. Arrange squash halves, cut-side-down, on a parchment-covered sheet pan. Bake in preheated oven until very soft, about 35 minutes. Remove and set aside to cool about 30 minutes. While squash halves are cooling, melt butter in large soup pot over medium-low heat. Stir in onion and cook, stirring often, until onion is very soft and beginning to brown, about 6-8 minutes. Stir in maple syrup, cinnamon, nutmeg and cayenne pepper. Scoop the cooked flesh from the squash halves and add to soup pot. Stir in chicken broth, increase heat to high and bring soup to a simmer. Reduce heat to low, cover and simmer for 20 minutes. Remove from heat and cool for five minutes. 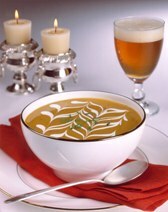 In food processor or blender, puree soup mixture, in batches if necessary, until very smooth. Return soup to pot, whisk in Brown Ale Beer, salt and pepper. Warm to a slight simmer. To serve, pour into four separate bowls and top with dollop of sour cream and two toasted walnut halves.